One of the Grand Residences set within the secure confines of the contemporary villa estate known as Upper Temple Hill overlooking Bali’s Jimbaran Bay, this villa is a multi-level property presenting five independent air-conditioned villa suites with king-size beds and en-suite bathrooms, a huge living and dining room with an integrated modern kitchen, an air-conditioned lounge with a fold-down bed, a 15-metre swimming pool with timber pool deck, a ‘bale’ relaxation pavilion and a small garden planted with beautiful flowering trees and shrubs. 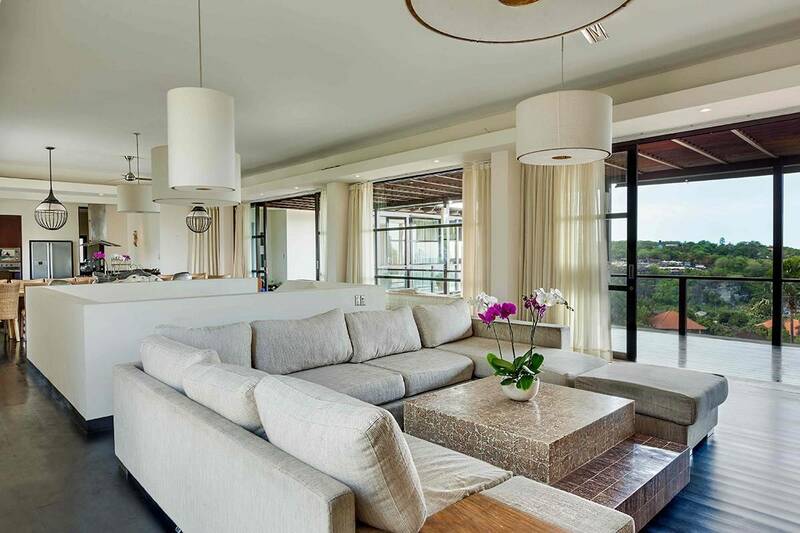 Characterised by dark wood, white walls and cream marble, the modern villas features an abundance of floor-to-ceiling glass doors and windows to maximise the glorious views. 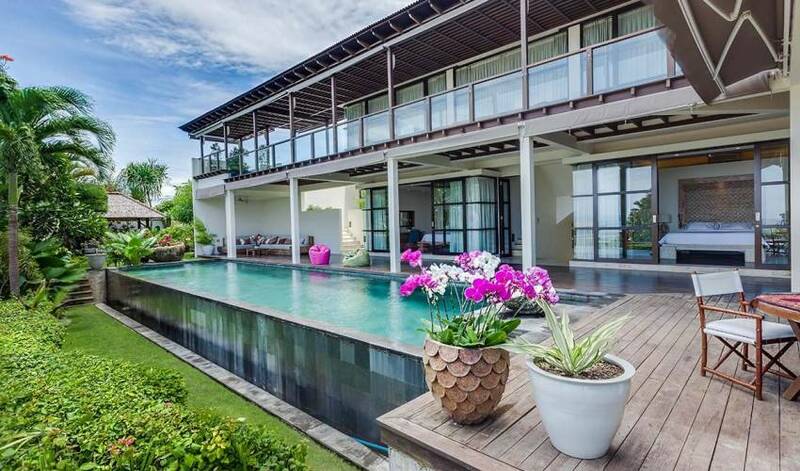 The picture is completed with a pair of adjoining outdoor roof terraces offering a spellbinding, panoramic vista spanning the Indian Ocean and Bali’s magnificent coastline. Two additional rooms (without en-suite bathrooms) serve as extra bedrooms for nannies or children. 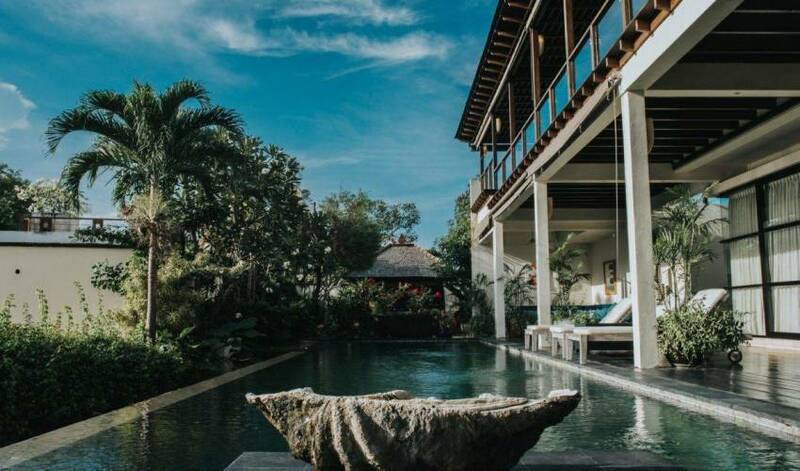 The villa is fully staffed with a manager, butler, housekeeping and security guards and optional driver, and is just ten minutes’ walk from Jimbaran Beach. 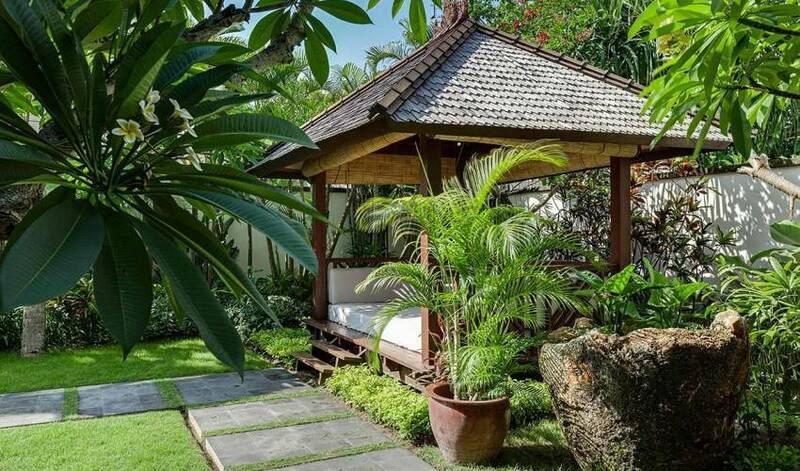 The villa can be rented entirely or per villa suite in different combinations and accommodates groups of up to 14 adults. 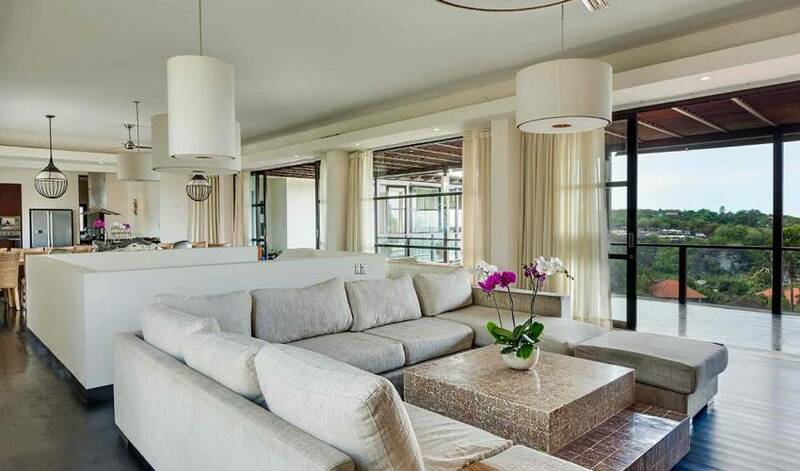 The open-plan living & dining room is located on the upper floor and blessed with stunning sea views. Hugely spacious, and equipped with both air-conditioning and ceiling fans, the room runs the full length of the top floor and is complemented by floor-to-ceiling glass doors that open onto a covered balcony presided over by an elevated relaxation pavilion. Positioned at one end of the room and separated by the stairwell, the living area is furnished with a large, segmented U-shaped sofa and a coffee table, and equipped with a home theatre set up incorporating a 50-inch satellite channel TV, DVD player and speakers. The dining area is on the other side of the stairwell, furnished with a teakwood table for 16. Adjacent to the dining area is an open-plan feature kitchen fitted with a black granite worktop / service counter and fully equipped with a four burner hob, extractor fan and hood, imported oven, double refrigerator, microwave, and everything else that is needed for the preparation of delicious meals. A cosy air-conditioned lounge room is situated beside the pool deck, accessed by sliding glass doors and furnished with a sofa, armchair and a coffee table, offering a quiet, cool place to chill out and relax. 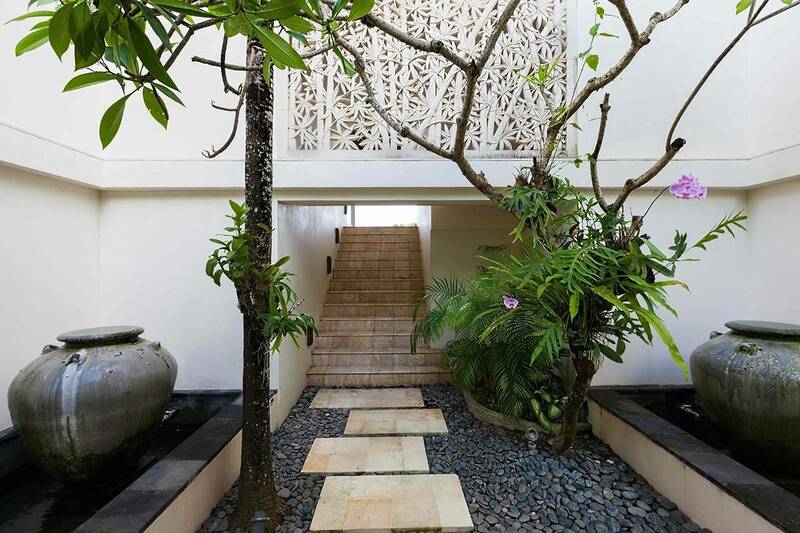 Ornately carved doors within the room slide open to reveal a pull-down 1.5-metre wall bed. 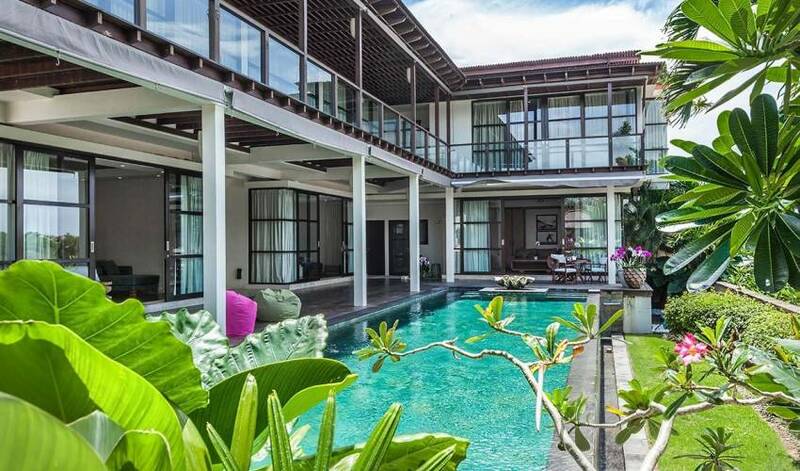 The villa is built around three sides of a 15 x 7 metre swimming pool, set within an inner courtyard on the lower level with a breathtaking outlook over the ocean and the Jimbaran hills. The pool is bordered by a broad timber deck, shaded by the canopy of the upper floor, which is supported by pillars to create a colonnaded area. One end of the deck is furnished with chairs, sunloungers and a small coffee table, while at the other end is a huge L-shaped sofa, big enough for a large group of people to congregate. Beyond this is a small garden area with a flat lawn and a spacious bale relaxation pavilion fitted with a mattress and cushions. 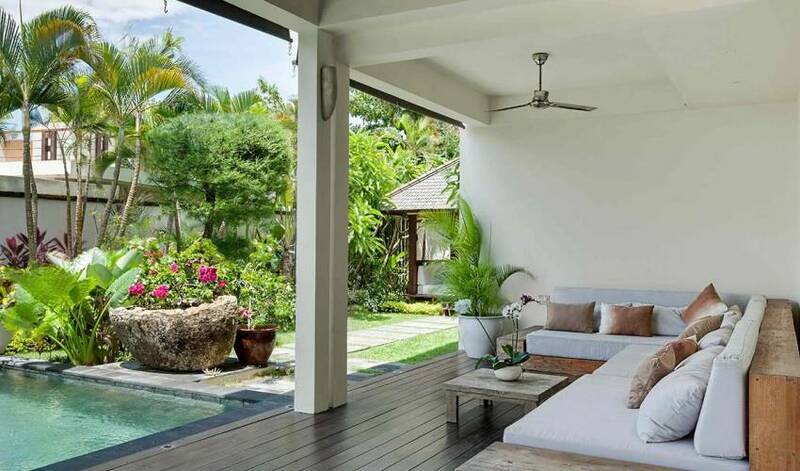 There is an open-air pool shower and a guest toilet and shower room adjacent to the pool. The breezy rooftop terrace on the highest level comprises two adjacent spaces on two different levels, one of which is furnished with sunloungers. Open to the sky, and bordered by orange flowering crown of thorn plants and cascading vines, these adjoining terraces are perfect for sundowners, barbeques, gatherings and small parties. On a clear day, there is a glorious sunset view across the bay with Bali’s mountains as a backdrop. 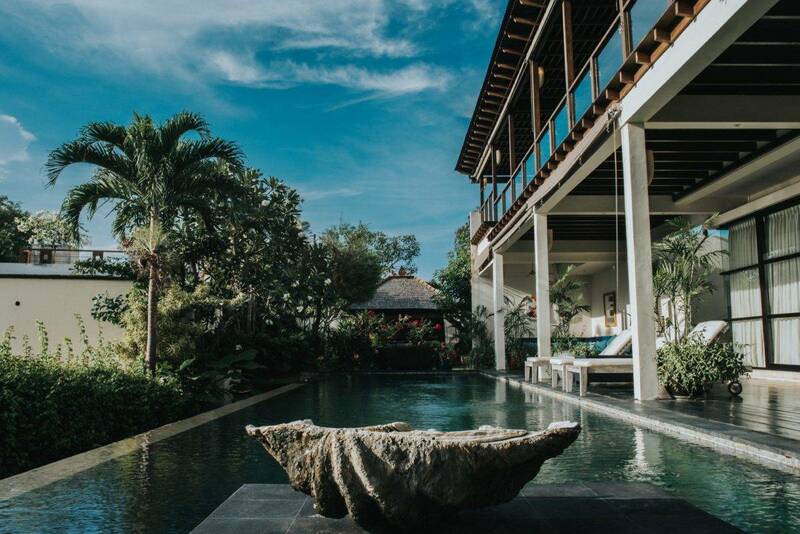 To the north, the narrow isthmus that links the Bukit Peninsula with the rest of the island is clearly visible, with the view extending past the crescent-shaped Jimbaran Bay, the beach, and the airport runway to Bali’s sunset coast. On the eastern side of the isthmus, Tanjung Benoa, Benoa Harbour and Sanur are also easily perceptible. 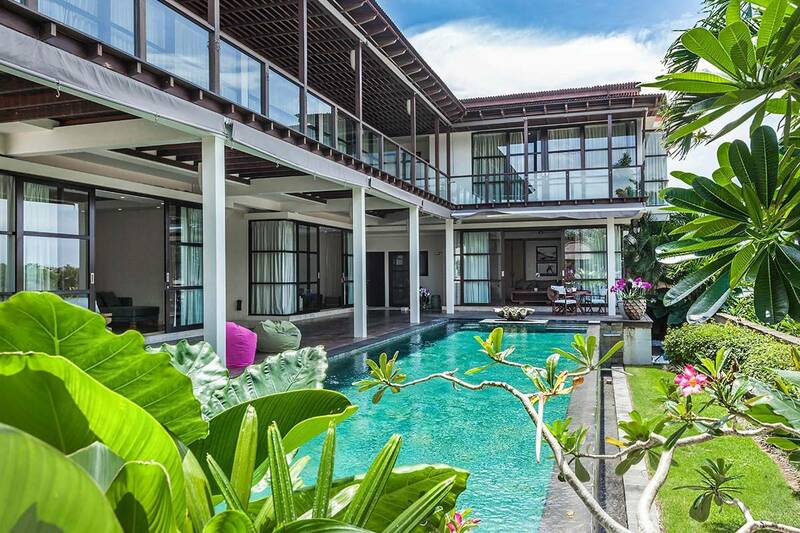 The scene is particularly spectacular at night enhanced by the lights of Kuta, Seminyak and Canggu. On a clear day, the awesome vista takes in Bali’s chain of volcanoes from the mighty Mt Agung in the east to the distant volcanoes of Java. 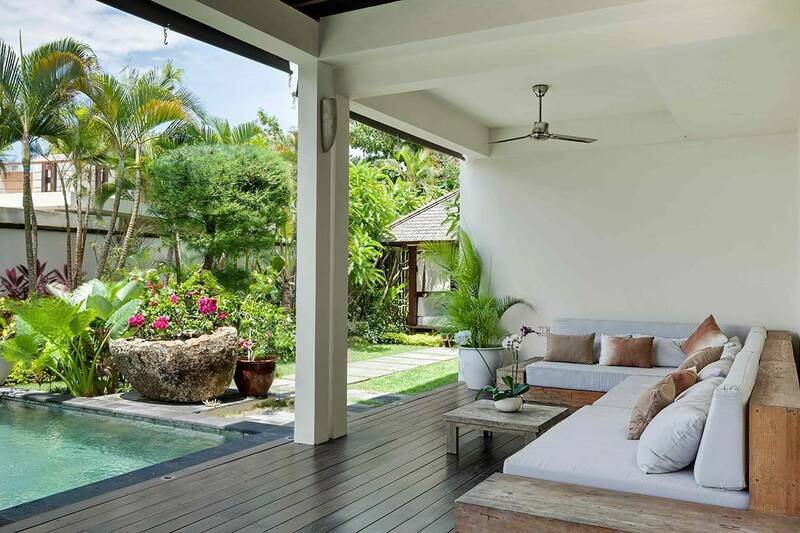 There are five independent air-conditioned villa suite here, including an opulent master suite. 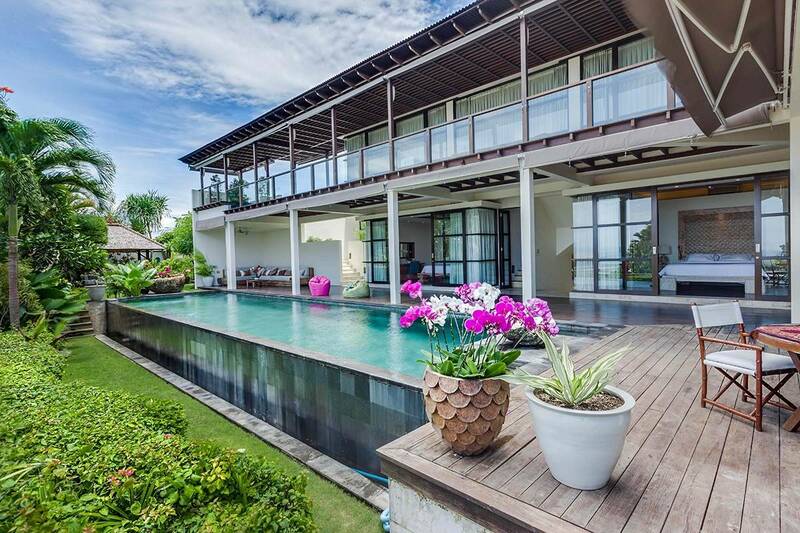 Four suites are located at pool level while the master is located on the top floor with fabulous views. Each suite features a hardwood floor and is furnished with a king-size bed, arm chairs, chests, and bedside tables. Two of the suites are situated beside the pool deck with their beds oriented towards the ocean view, while another has its own private terrace. Dressing areas are fitted with wardrobes and storage space. Each suite has a marble en-suite bathroom fitted with a standing rainshower, a toilet, and a vanity unit with either single or twin washbasins. The master bathroom and one of the suites has the additional luxury of a bathtub, and one has an open-air shower. Two additional air-conditioned rooms (without en-suite bathrooms) serve as extra bedrooms for nannies or children. Each is furnished with a double bed. The air-conditioned lounge room is equipped with a pull-down wall bed and a baby cot can be provided for infants. 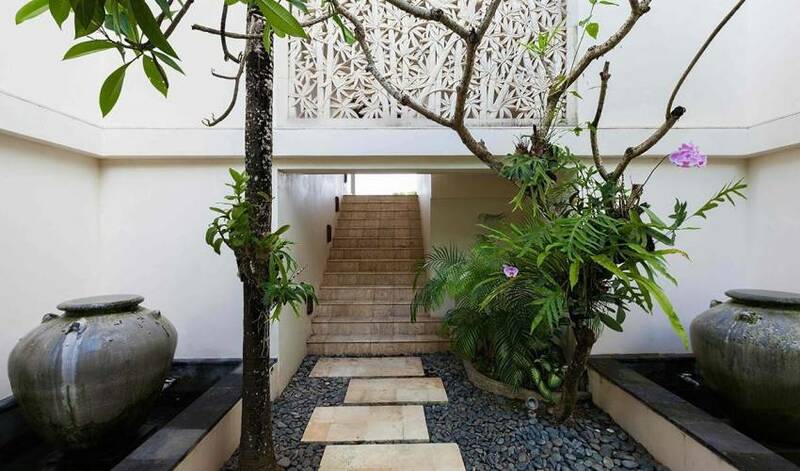 The villa is located on a scenic hillside, one kilometre from Jimbaran village and the golden sands of the west-facing Jimbaran Bay, which curves for five kilometres from the southern side of the airport to the start of the Bukit Peninsula and is home to many great resorts such as the Four Seasons, Intercontinental and the Ayana Resort & Spa. Just down the road is a thriving fruit and vegetable market, but what makes Jimbaran really famous is its fresh fish. Every morning, the fishermen return to the shore in their gaily-painted vessels to trade their marine harvest at the bustling Kedonganan fish market. The seafood warungs (eateries) at Jimbaran Bay are a favourite destination for visitors. The neighbouring Bukit Peninsula presents some of the most idyllic beaches in Bali; hidden sandy coves – a dream for both surfers and non-surfers alike. 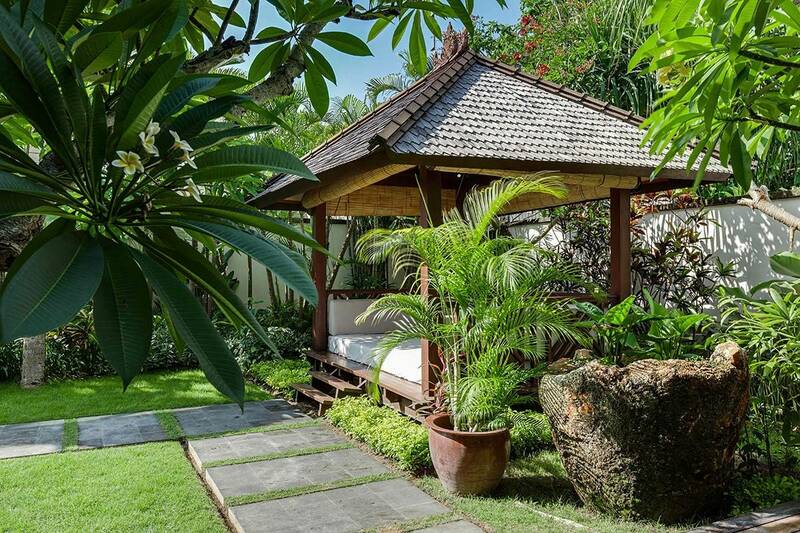 There are two championship golf courses on The Bukit, as well as the Bali Collection shopping centre at Nusa Dua, countless spas and luxury hotel beach clubs.